It`s a Eureka Moment again ! 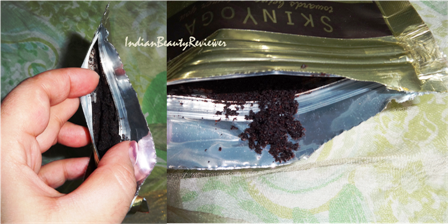 A New Discovery in Skincare hailing from India. 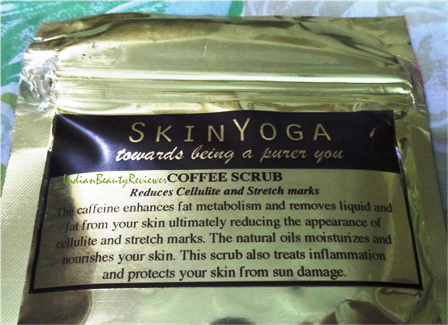 It`s called SKINYOGA, a brand of 100% natural plant-based skincare products. 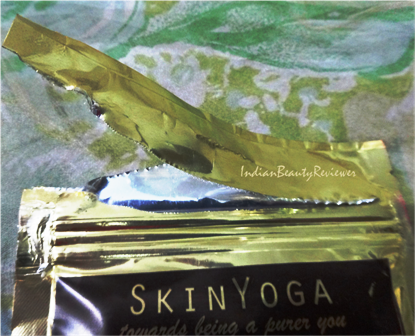 Skinyoga is a very apt name for this brand because the products claim to have a purifying and healing effect on the skin just like yoga has for the body. SKINYOGA is owned by three sisters Radhika Choudhary, Jagriti Choudhary and Deepika Choudhary who have gained education and experience in the Beauty Industry in Europe. They say that Skinyoga had to happen. It was ingrained in them to always go the natural way. “Skin is the largest organ in our body. Just like heart and kidney, skin plays an important role in our day-to-day life of protecting, absorbing, regulating and storing. 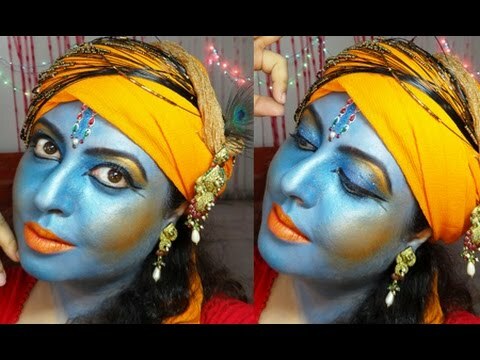 Our skin needs appropriate maintenance for it to perform its functions and for us to look attractive. The best way to do that is with the help of Mother Nature that has been around since much before our skin and much before the invention of chemicals. Our body and our skin react positively to natural lifestyle for a simple reason that human body is connected with nature in the minutest ways. Yoga is a discipline from ancient India, practiced to attain physical, mental and spiritual balance. The followers of Yoga experience a unique sense of calmness and completeness. It is for this feeling of Yoga that makes billions of people worldwide vouch for a routine so natural and self-contained. That was a little brief about the brand. Now coming onto the Coffee Scrub. I received the 70 g pack of the scrub in my EnvyBox for April 2014 and I recently discovered it in my skincare stash and decided to start using it just 3 days ago. Its full size (Net Wt. 7.05 oz - 200 g for Rs. 850 INR) is available online on the SKINYOGA WEBSITE. They also ship worldwide. The packaging is a golden pillow pack which can easily support itself standing on the shelf. Packaging is neither bulky nor space consuming and very travel friendly. Infact it can fit into any corner of your bathroom cabinet/ dresser drawer/ bag easily. 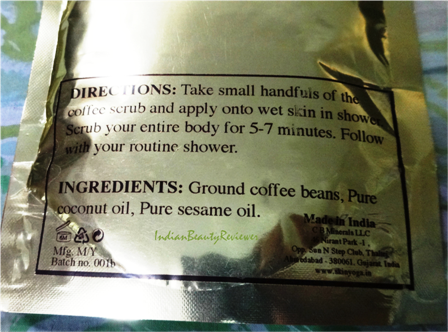 The scrub smells exactly like regular coffee found in one`s kitchen. The color however is muck darker, almost black. The texture is granular and consistency is like a dry granular powder. This scrub aims to reduce cellulite and stretch marks. We all have a little cellulite and jiggly skin here and there so I figured that using this scrub in the shower two or three times a week would definitely assist in keeping the cellulite and stretch marks at bay. Caffeine in the Coffee Beans enhances fat metabolism and removes liquid and fat from the skin ultimately reducing the appearance of cellulite and stretch marks. The natural oils (coconut and sesame oils) moisturize and nourish the skin. 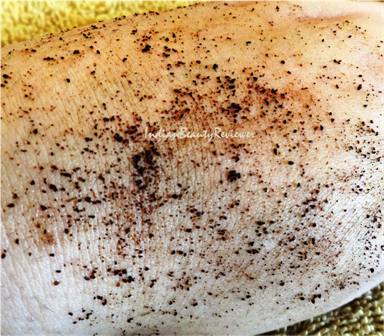 The scrub also claims to treat inflammation and to protect the skin from sun damage. (How can scrubbing the skin treat inflamed skin or protect it from sun damage, I wonder !!! Is it the Caffeine in the Coffee Beans, the Coconut oil or the Sesame oil? Because the scrubbing action itself definitely cannot treat inflammation but only exacerbate it.) So I feel the description on the pack should be rephrased such as to make the anti-inflammatory and damage preventive claims a bit believable. 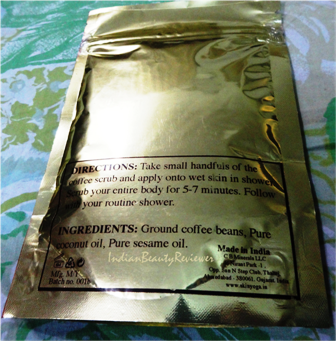 · Take small handfuls of the coffee srub and apply onto wet skin in shower. · Scrub your entire body for 5-7 minutes. · Follow with your routine shower. First showered using a mild body wash without a loofah. Completey avoided harsh soap since I was anyways going to scrub-a-dub-dub. Next I used the scrub. Rinsed off the scrub with plain water (No soap now) and patted dry. I felt that using a bodywash first helped me get rid of the sweat, sebum and dirt on the skin. Using the scrub afterwards not only helped me get rid of dead skin cells but also let the ingredients in the scrub do what they are meant to do without me having to wash off the oils in it. I feel the moisturizing and therapeutic effect of the Coconut and Sesame oils would not be proper if soap was used afterwards. My skin felt softer, smoother and definitely tighter. After three consecutive days of using the scrub I did notice more toned skin especially on the areas of the body where the skin is slightly flabby like the arms, lower tummy, hips and inner thighs. Also the upper back felt firmer and toned. I did not notice too much of a difference in the appearance of existing stretch marks but probably three days is too less of a time to tell the difference. However I do feel if this product is routinely used, it can help in preventing the occurrence of new stretch marks. 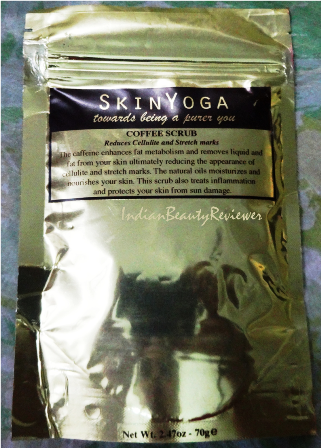 So all in all I would highly recommend using the SKINYOGA Coffee Scrub on a regular basis to keep the skin cellulite-free and maintaining a smooth and firm skin. The product does an extremely good job. Could you use this on face too? Ik its a body Scrub but still?